Do you ever wonder what the most effective way to motivate your employees is or how to retain top talent? What about ways to strengthen relationships with clients or increase productivity within your team? No need to keep wondering – incentive travel is an extremely powerful tool that can accomplish all of those goals. In fact, the Incentive Research Foundation found that non-cash rewards like travel are 2-3x more effective than cash. 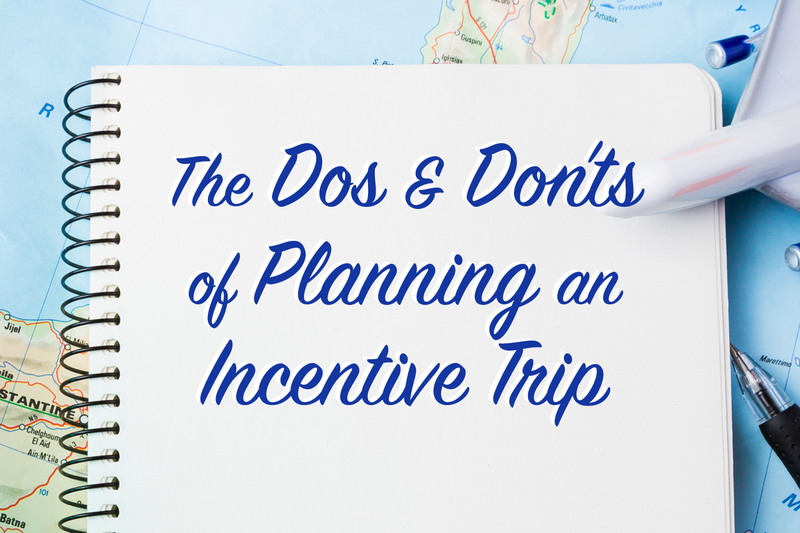 But before you dive headfirst in planning an incentive trip, read our dos and don’ts to avoid making any crucial mistakes. Do generate buzz and anticipation before the trip. Announce the trip in a fun way that will excite your employees and/or clients. Don’t forget about the crucial time between announcing the trip and departing for the trip. Send “connect” pieces, like a packing list or recipe for a dish from the destination, to motivate employees to reach their goals so they qualify for the trip. And once you announce the winners, be sure to send another touchpoint a few weeks prior to the trip. Do vary the destinations. Ensure that your attendees receive a true incentive experience by changing up where they go and what they do. The goal is for them to want to qualify for the trip and then have a wonderful experience during the trip so they leave eager to win a trip again. Don’t try to do it all yourself. Look for an experienced partner who can handle the logistics and nitty gritty details so you are free to think big picture and enjoy the trip. When looking for planning help, seek out an organization with a history of successful programs, extensive knowledge of destinations, and strong relationships with properties and vendors. Don’t forget the attendees are winners! They have earned this trip, and it should feel like a prize from beginning to end. Keep the trip focused on them. Do allow time for leisure and for individual activities. Attendees will have an even better experience when they have time to explore the destination and do the things they really enjoy. Don’t give cheesy gifts. Keeping the program all about the attendees means understanding what they would like as a gift. You want to give them items they actually want to make room for in their luggage to take them home. Do take time to get to know your employees or clients. Creating memories and strengthening your relationship with people within your organization will build trust and loyalty – two crucial aspects of employee and client retention. Don’t forget to relax. You are on an amazing trip after all! And when the boss is relaxed and comfortable, everyone else can be, too! So now you know some of the key tips for planning an incentive trip. For more information on incentive travel, click here.